“Pizza!” is now one of Cody’s favorite words. I’d love to say that we always make fresh, homemade, healthy pizzas but that just isn’t true. However, we do often make our own pizzas and this particular recipe has been in the Team Buell cook book for years. You can make it with either store bought or homemade dough (I recently tried Bobby Flay’s dough and it was absolutely perfect). This meal is great for fulfilling your pizza craving when you’re not trying to go totally nuts. The best part about this pizza is the heavenly caramelized onions. They’re so sweet and pair so beautifully with the walnuts and blue cheese. I think next time, I may add some sizzled bacon bits to add some additional smokiness. You may try that, too of course! Warm the olive oil in a large skillet over medium-high heat. Add onions and saute, stirring, until they begin to turn translucent, about 5 minutes. Add sea salt, black pepper and rosemary to the onions and continue to saute, stirring occasionally, until the onions are very soft and the color of caramel, about 15 minutes. They should also taste very sweet. Remove the pan from the heat. Sprinkle the flour over a clean work surface and begin stretching the pizza dough out to about a 14-inch diameter. Dust the bottom of a baking sheet evenly with the cornmeal and lay the dough on top. Top the dough with the onions and bake for 8-9 minutes, or until the dough is firm to the touch and just beginning to brown. Sprinkle the blue cheese and walnuts over the onions and return to the oven for another 3 minutes or until the cheese is just beginning to melt and the crust is a light golden brown. 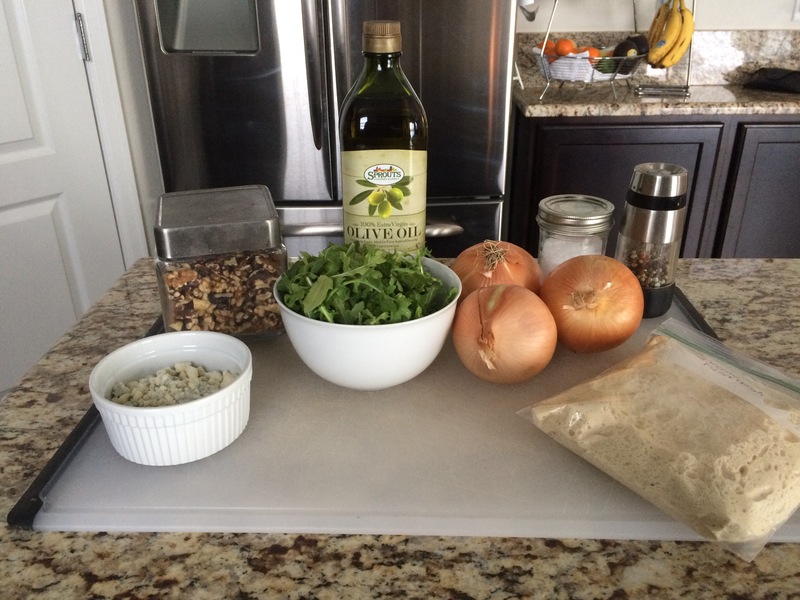 Remove the pizza from the oven, top with arugula and serve.